As of now I am a 2 Dan with 128 games and 52.3 hours of play. Not all of it was 4 player. I did play a few 3 player matches to try to figure out the rules. My mean position is 2.488. That’s lower than I’d like but hey, we all could use some improvement. A highlight that I’d like to point out is my maximum points of +104. That was the game where I got my first yakuman! It was a dealer kazoe yakuman too! Anyways this summer, I’m definitely going to be playing a lot more. I hope to improve my skills and gain more experience in general. Some things I need to work on are tile efficiency and defense. A lot of times I find myself slow in getting to tenpai even with an open hand. Also I’ve dealt in a lot recently (16.2% deal in rate overall) and lost a lot of ranking points. 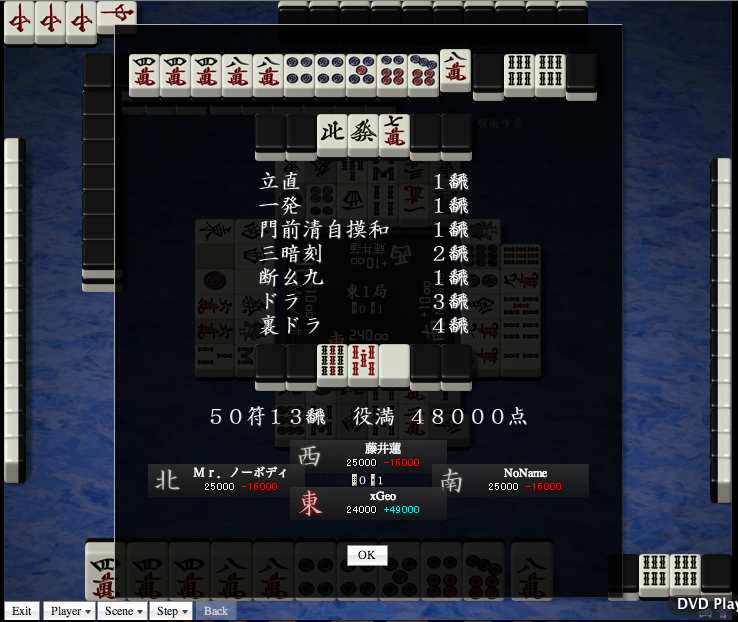 Categories: Tenhou | Tags: Stats, Tenhou, Yakuman | Permalink. As this is first post on this blog, I shall explain what this blog is about. This blog will focus on Japanese (Riichi) mahjong and anything else related. I hope to create an online resource to help English-speaking players learn about Japanese mahjong. When I was learning mahjong, there were few resources online in English to help me learn. However the type of mahjong with the most resources (relatively) was Japanese mahjong, and that is why I am most familiar with this variant. In the first stages of the blog, I will be writing sections on how to play mahjong and the basics of using Tenhou. Posts will mainly be about mahjong games I’ve played that I want to comment on, musings on mahjong theory (I’m still learning so I’m no expert yet! ), and discussion of mahjong anime/manga. I am still new to blogging and using WordPress, so I’ll be playing around with the format and functions of the site. Categories: Uncategorized | Tags: introduction, Japanese mahjong, mahjong, online resource, riichi mahjong | Permalink.